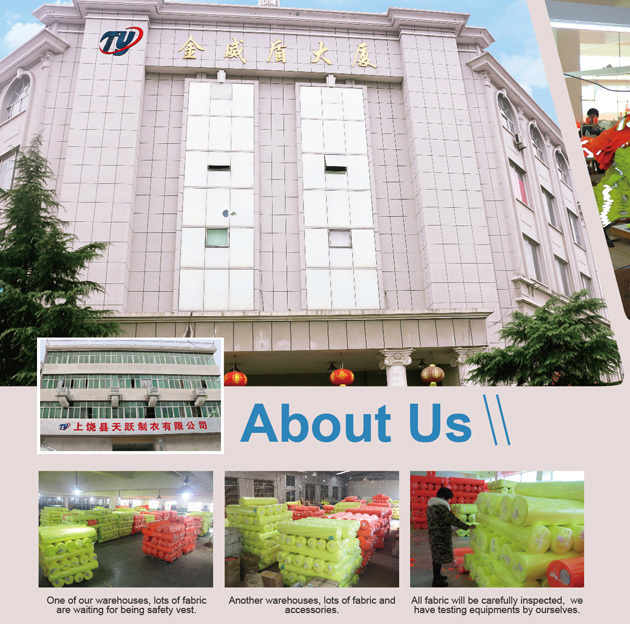 TY started to produce high visibility clothing since 1998 with own factories in Wuyi, Zhejiang province and Shangrao, Jiangxi province, which covering 20000 square meters. We specializing in the production of safety vest(hi vis vest, high visibility waistcoat), reflective safety jackets&pants, safety polo shirts clothing, safety fleece hoodie, sweatshirt, workwear and other safety products, the monthly capacity is 1 million pieces of mixed style garments. Has the advanced production and test equipments. we attach great importance to our QA/QC procedures, making sure every piece we ship to our customers are qualified as well as satisfying! We are devoted to be your best and qualified supplier! We believe that cooperating with us, will achieve mutual benefits and win-win situations!